I sat down to write this seven hours ago. I began with great intentions. But one thing lead to another, my thoughts become distracted, other priorities popped up and seven hours elapsed. There’s a great children’s book If You Give a Mouse a Cookie which describes this very thing. A mouse is given a cookie, but then he wants a glass of milk. Eventually, the story loops back to where it began but not until after a big adventure. My day was not a big adventure, but I did organize my closet! But I digress. Today’s treat regarding memory wellness is all about paying attention! Following the children’s book theme, my encouragement to us all is ‘if you pay attention to just one thing, you’ll soon make more memories’. This isn’t earth-shattering news, yet it’s a constant battle for some of us. We feel like we have so much to do, want to do or are interrupted, it is then difficult to pay attention to just one thing. But we need to if we ever hope to remember anything. 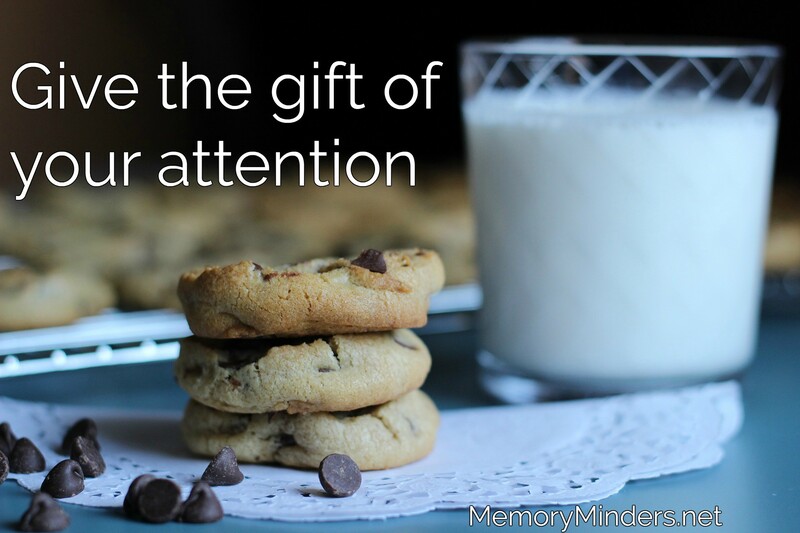 Paying attention not only has ramifications for our memory but also our quality of life. It’s the idea behind the mindfulness craze but is also what our teachers and parents told us as kids: remember to pay attention. By simply paying attention, we can be more aware and appreciate all the moments and people in our lives. Paying attention is not always easy. It takes discipline and a calm head to think through what is most important in each moment and choose wisely. It eliminates multitasking as much as possible to focus on our important moments in the actual moment. It takes wisdom and discernment to know what to tune into and what to tune out. Memories are created by the present of our presence. Let’s not miss this precious gift.